One trend DreamWorks seems to have with their movies is attempting to ride the line between children and adult entertainment. Studios like Pixar, and to some extent Disney in their Renaissance, showed that animated films could be just as enjoyable to parents as to their kids, and with its high profile celebrity voiced and pop culture references, many DreamWorks films have tried to take strides to pulling in adults. How successful this is varies from film to film, but this is an example where they seem to have gone too far. 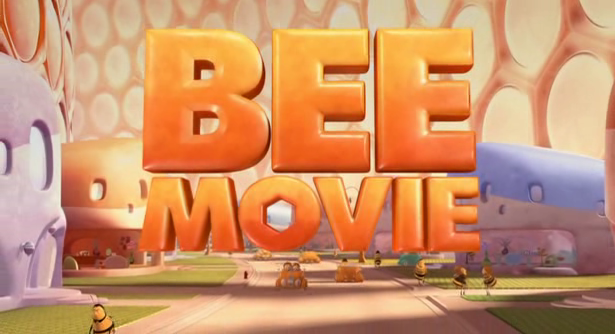 Bee Movie stars and is co-written by Jerry Seinfeld, who is real big with the kids, and is an incredibly awkward movie in that I’m really not sure who it’s for. It starring an animated cast of bees certainly makes it seem like it’s targeted for the little ones, but a lot of its subject matter and humor, the story ending up at a high stakes trial with celebrity guests and other such elements I would think go way over the heads of any kid. It’s a very bizarre film in its execution, but in terms of the film itself just comes off as very bland and forgettable. Barry B. Benson (love that alliteration) is a go-getter bee ready to enter the workforce, but immediately becomes disillusioned when he finds whatever job he chooses he’ll work at for the rest of his life. Not wanting to get pinned down, he goes out into the world with the rough tough pollinators for a day, only to experience how dangerous a bee’s life can be in the human world. He’s saved from being squashed by a woman named Vanessa, a bug sympathizer, which Barry breaks “bee code” to talk to, and the two develop a kinship. It isn’t long after that that Barry discovers that humans harvest honey and sell it for themselves. Outraged, Vanessa helps him organize a class action lawsuit against the entire human race to get the rights to their honey back. He ends up winning, but finds this garners disastrous results: his entire hive becomes layabout loafers, and worse yet, with no bees to pollinate, plants all over the world are dying, leaving it all up to Barry to get things back the way they were. So Barry is a sort of a quipster, with a dry, commentating sense of humor, always armed with some witty joke. And he’s got Jewish parents. And his hive is in New York. He’s basically Seinfeld in bee form. Following that, the basic premise of a single insect in a massive working society feeling like he’s made for something more echoes closely to Antz, so I was rather tired with the movie right from the start. On top of that… bee puns. Lots and lots and lots of bee puns. The title itself is a goddamn pun. Most of the humor is either that or Seinfeld-type asides and banter, which become weary very, very quickly. Along with that, the basic plot is basically a gag with the bee trial, and that’s kind of a big issue of the film. Bees wanting to sue the humans over stealing their honey? A funny idea, sure, for a SNL sketch, maybe. But making it the lynchpin for an entire movie? Dragging it on as long as they do just makes it feel even sillier than it already is, and when they want to draw drama out of it when Barry’s friend cheats death by stinging the defendant, it not only falls flat, but ends up feeling incredibly bizarre, to the point where I’m not entirely sure what I’m supposed to be relating to. Another part of the movie I’m unsure what to make of is Barry and Vanessa’s relationship. Barry does seem smitten with her, like in a romantic sort of way, but the film doesn’t really further address or resolve any of this. Not that I’m expecting any sort of weird inter-species romancing going on here, but that’s just another folly of the film. Had this been a late night sketch, or maybe even something out of South Park, a bee suing the human race, whilst having a physical relationship with a human, is rife with comic potential, but in this safe PG environment, all of the elements just lay there and are played out in the most by-the-numbers way possible. In the end, Barry is solely responsible for making the planet a barren wasteland, because apparently bees are the only insects that pollinate in this universe, and he’s got to make things right. He and Vanessa get some of the last flowers available on a plane to head back to New York, and with some bee assistance get it to land. Then he beseeches his bee brothers that they need to do what bees do best, like he’s giving them a pep talk for some reason. He’s the only one who was averse to being a bee, now he’s motivating everyone else. And no apology either, he just saved the day and is a hero. Eh, whatever. I don’t know what I was expecting. This film ends up not being DreamWorks’ worst only because Shark Tale exists. I wouldn’t say it’s lazy, but in some regards it is; its fatal flaw is its inability to decide what exactly it is and who it’s targeting. Kids won’t be able to really understand any of the stuff with the trial and guest spots by Sting and Ray Liotta, and adults certainly aren’t going to stick around for a softball cartoon starring cutesy bees. So in the end, it kind of becomes a movie for nobody. I just don´t get it. This film is really being hated. And honestly, I really enjoyed this one. I like the creativity how the bees work, I like the flying scenes which are just great, I like the characters, I like the colourfull animation. Some puns are not that great… but from Dreamworks – this is the one that I actually really enjoyed. Even more than some of their great hits.